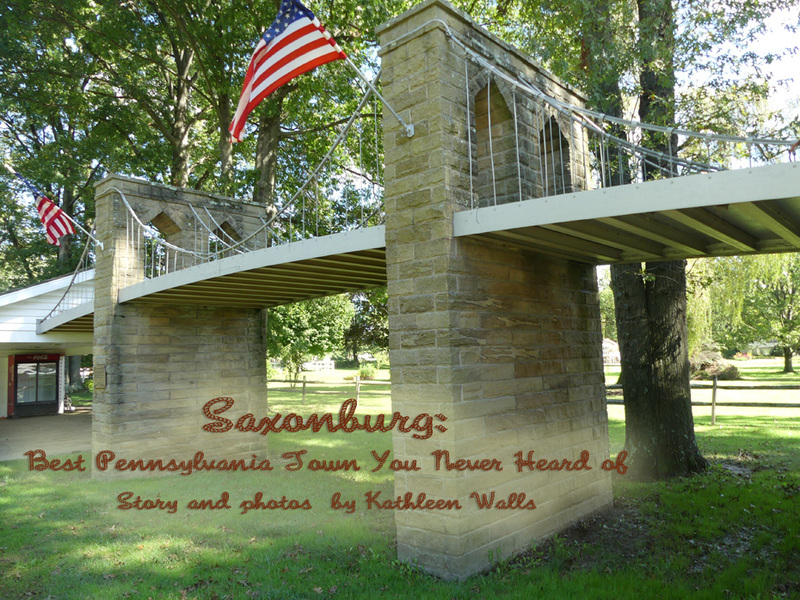 Saxonburg, Pennsylvania is a beautiful example of what one immigrant can do for this country. John Roebling and his brother, Carl, came here in 1832 to escape totalitarian conditions in Germany. They founded the town of Saxonburg mainly as a farming community. After about five years of farm life, Jo hn returned to his original profession as engineer. He opened a wire twisting workshop where he learned to increase the strength of wire by twisting it into a rope much stronger than the sum of its parts. The rest is history. 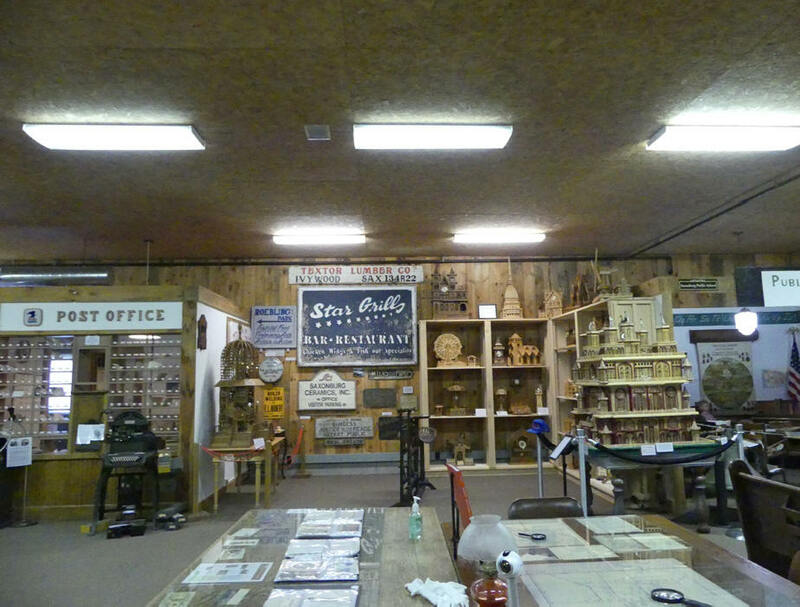 Much of Saxonburg history and Roebling's inventions are showcased in the Saxonburg Museum created on the site of his wire twisting mill. One room is devoted to Roebling's inventions. His most famous creation is showcased outside the museum connected to his workshop. It's a replica of the Brooklyn Bridge. 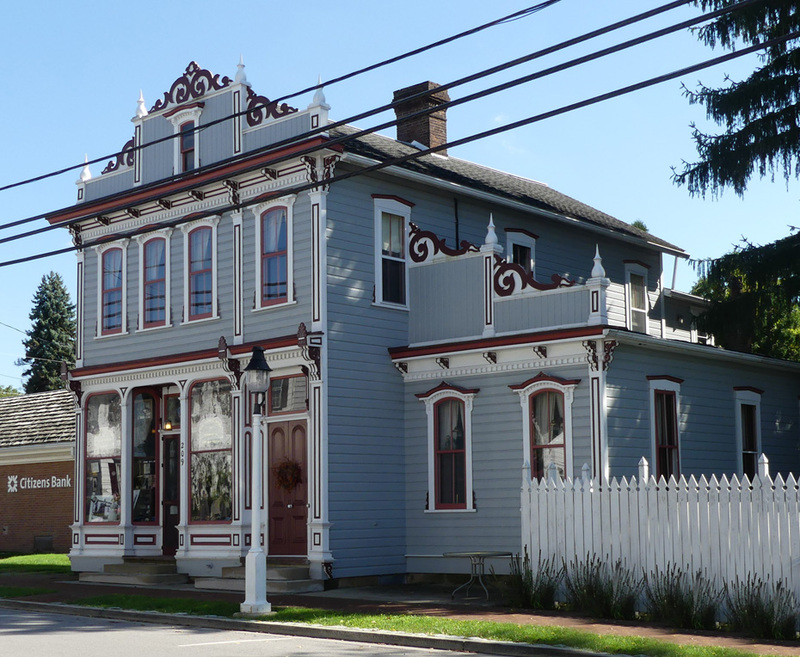 Something else John Roebling, along with his brother, left for the world to enjoy is the historic town of Saxonburg. The Saxonburg Historic District was listed on the National Register of Historic Places in 2003. 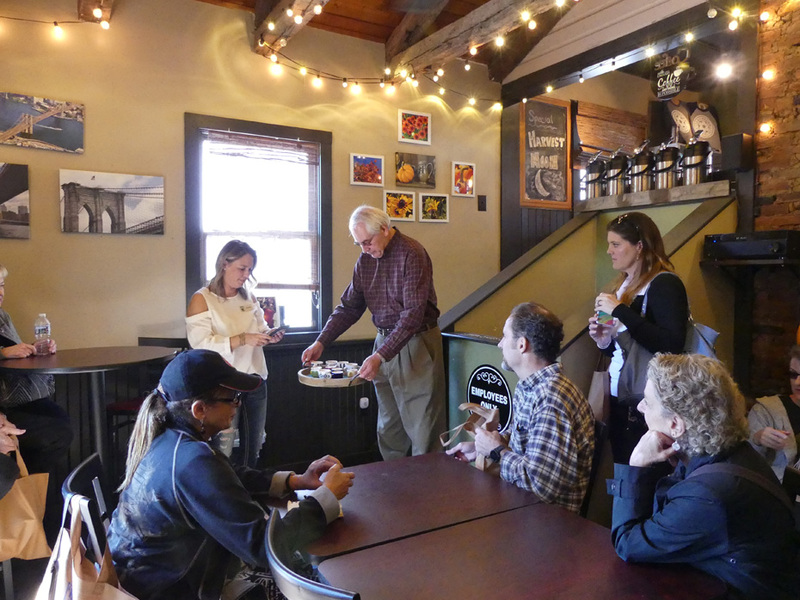 We took the 'Burgh Bits and Bites Tour with guides, Sylvia, the tour founder, and Fred. This tour is about the history as much as the food. Both are Germanic and interesting. Beginning with the church, now the Saxonburg Memorial Presbyterian Church, perched at the town's highest point; it's like stepping back into the past. There are 32 buildings that are more than 100 years old. Even the street lamps are made to look like the old gas-burning models used at the turn of the 19th century. Almost every house and building has a historical plaque on West Main Street. There were so many places we visited and learned about but here are a few of my favorites. 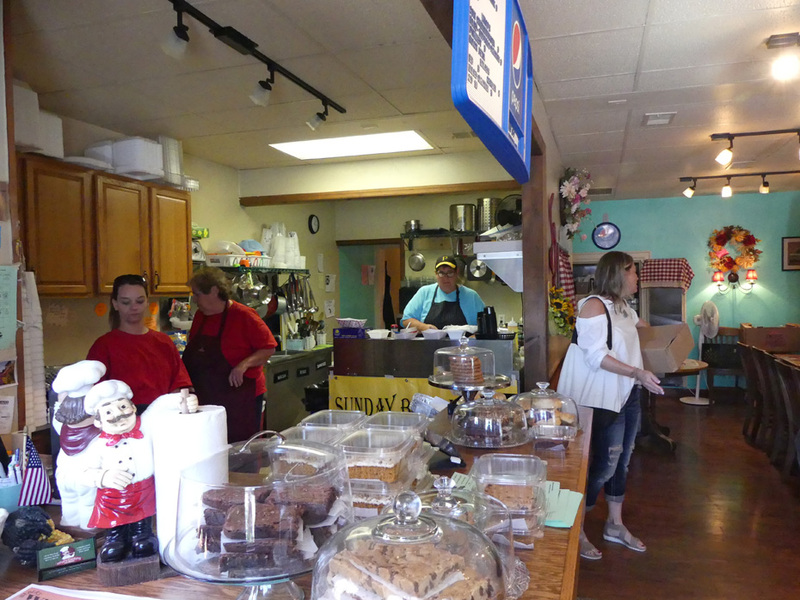 From The Main Street Bake Shop we enjoyed great cinnamon rolls. Megan, the self-taught baker here, creates beautiful cakes and cookies for an old tradition. Sylvia told us, "A Wedding Cookie Table is a tradition in Pittsburgh area. You'll find there is a large table of cookies. People were often immigrants from eastern Europe. They were workers in the steel mills and when a relative got married often they couldn't afford a large cake so they made cookies from old family recipes. You'll still find Wedding Cookie Tables at many wedding is in the Pittsburgh area." Next we visited What's Cooking on Main. Rhonda, the owner, has been here almost three years. She prides herself on all homemade dishes with local ingredients. We sampled the Bacon Cheeseburger Wraps and, their signature soup, Sausage, Potato, Kale Soup. For folks in a hurry, there are takeout meals. She also offers vegetarian choices for non-carnivores. Every night they do a different dinner special. Many of them are old fashioned German style favorites like liver and onions, meatloaf or pot roast. They are open seven days and Rhonda said, "If you see my truck out there come on in. You can bring your own wine or bottle. Some people come in and play cards at night." At Batch we saw how two women with one dream could create a fantastic business. It's part restaurant and part retail shop with unique food and crafty creations. 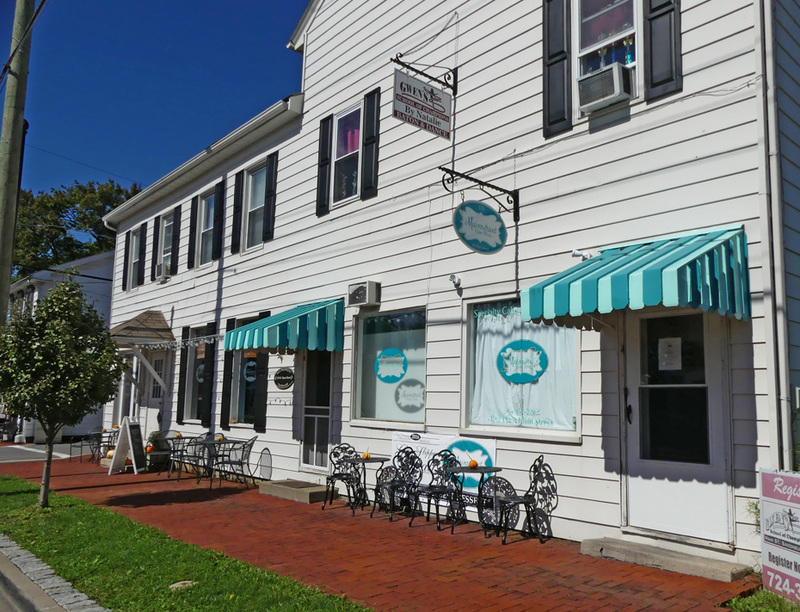 Meghan and Jessica have produced a place where you come to sample homemade gourmet food and can shop for gifts that are unique as well. 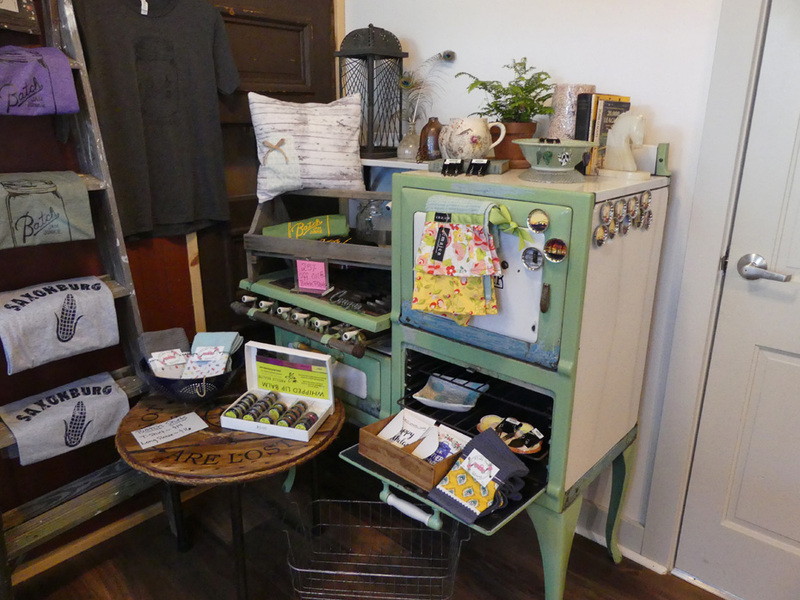 In the retail area you'll find homegrown and handmade items like potted plants, candles, pillows, soap, lotion, jewelry, clothing and more, all locally made. We sampled the tasty quiche. However the food is always changing depending on what is fresh and local. Jessica produces some really unusual jellies and jams too. Try Monkey Butter or Black, Blue, and Bourbon. 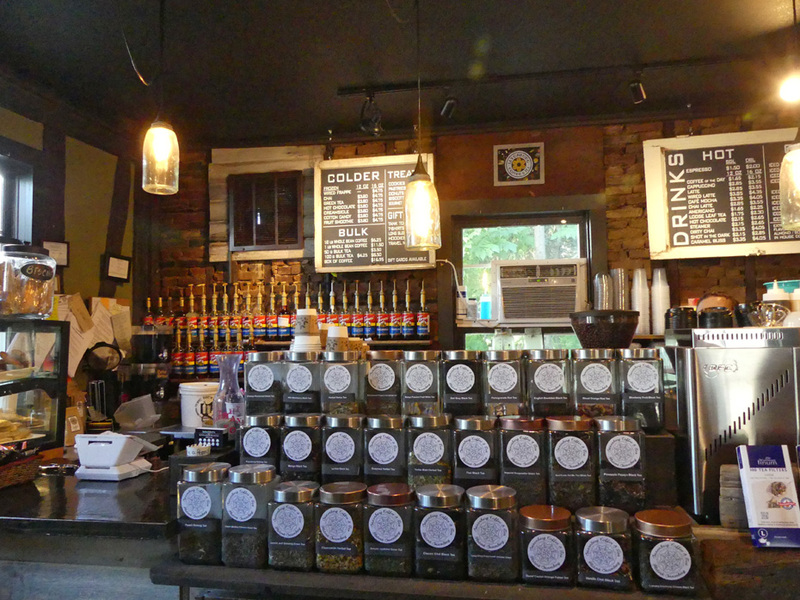 Saxonburg's answer to Starbucks is the Saxonburg Coffee and Tea Shop. It's located in what was once a summer kitchen. The original house had to be torn down in the 1970s. It was once home to the Vogley family and then the Schroth family. Some of the original kitchen building and basement remain. Melinda owns the coffee shop and Maria started doing ice cream seasonally. It is carrying on an old tradition as Granny Schroth used to make homemade ice cream and sell or give it out the back kitchen window. The pictures on the wall tell Saxonburg's historic past. Roebling Raspberry ice cream was the perfect partner for my Roebling Raspberry tea. The tea package is imprinted with a Rosette pattern that John Roebling designed as the emblem for his Allegheny River Suspension Bridge in Pittsburgh. Their coffee is also named in his honor. “Wired Rope” coffee is their locally roasted coffee blend made with a rich blend of Indonesian and South American beans, medium roast with full bodied chocolatey finish. The shop’s primary logo consists of coffee beans designed like a twisted wire rope cable. They recently added Wire 2720 blend, a dark, sweet roast that is named for Roebling's twisted wire patent number. 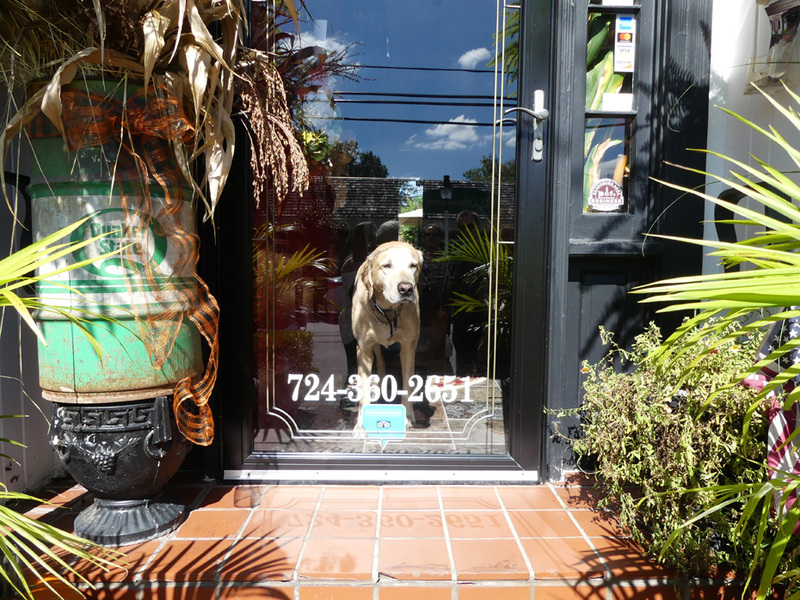 At Mainstay Bed and Breakfast, the resident dog, Bentley, greets everyone at the door. Jim, the owner, told us the house was built 1835 for the Humbolt Family. In 1910 it became a feed store and then Mellon Bank. Saxonburg Ceramics was founded in 1924 by one owner, George Aderhold, who lived there until his death in 1961. Last members of his family were there until 1993. George Aderhold's workshop is out back and ceramic pieces embedded in the sidewalk in the back yard. Next it became a bed and breakfast. Jim and his partner have owned it for the past eleven years. Each of the four rooms is styled differently. Jim told us, "Up in the safari room there is a ghost named John, I don’t know anything about him except he's very friendly and like having fun. That's what we do here." 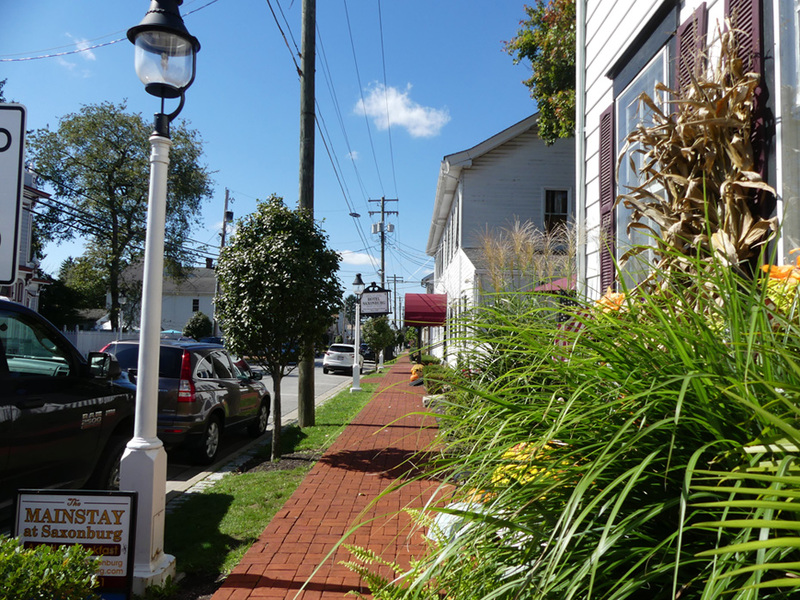 You have two good choices for staying in Saxonburg. Just down the street we visited the Hotel Saxonburg. They are a small hotel retaining its 19th-century décor. 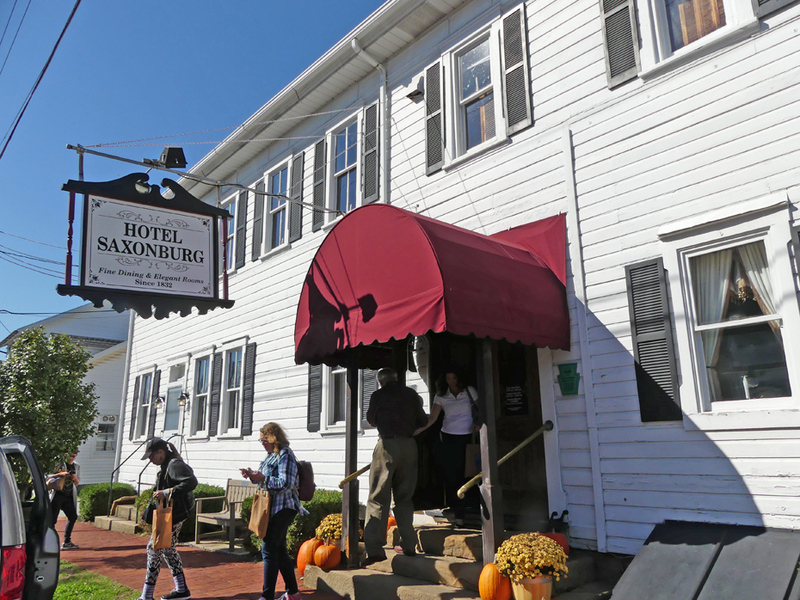 The Hotel Saxonburg has been a landmark since opening during the mid-1832. Hotel Saxonburg was originally known as the Vogley House until 1863 when it was purchased by E.F. Muder and renamed the Union Hotel. Judging by the time frame, it had to have a Civil War connection. Francis Laube was the next owner who unimaginatively renamed it the Laube House. In the 20th century the Gentile family bought it and operated it until 2010. Presently it has a female owner as many of the local business do. Judy Ferree renovated Hotel Saxonburg in July of 2010. She was careful to maintain the historical integrity. Not only is the building historic but the furniture is also historic. As befits a hotel this old, it has some ghost stories which have been investigated by paranormal groups. One place in the hotel that showed a lot of activity was a room where President Woodrow Wilson stayed in 1917. Downstairs you can view the ledger showing Wilson's bill as "not paid." The dining room offers some delicious choices. Alan Green is the executive chef. We had a light meal of waffle fries and turkey with homemade gravy. 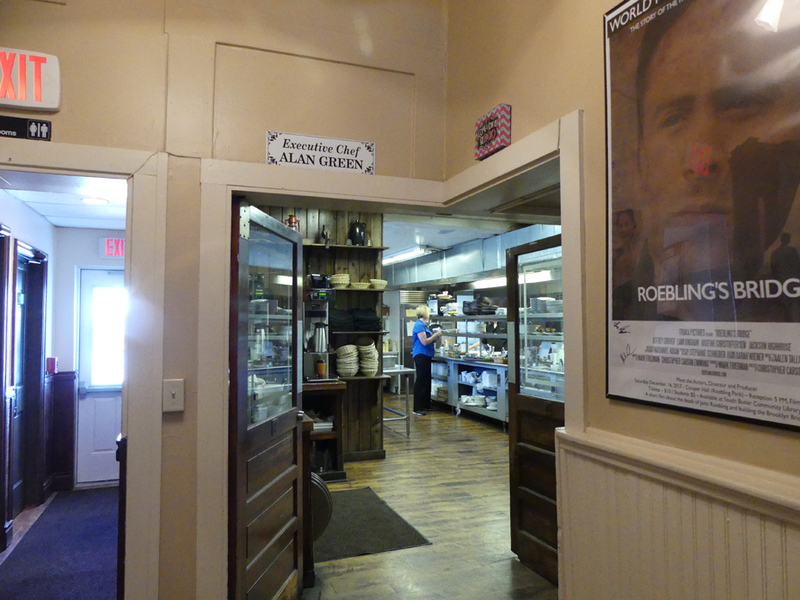 As an award winning chef, Green features an American style menu. Their lobster bisque is world famous. The arts are not neglected in Saxonburg. We visited Three Rivers Art Glass. Here you can make you own jewelry or dishes. One beautifully preserved building that retains it character was once home to Edward Napoleon Bonaparte Mershon and Homer Lafayette Mershon, brothers and doctors. Fred told us the history. Their office was in back and their drugstore in front; living space was upstairs. Edward Mershon's daughter, Edna, lived there after her father's death. She never married and let the home fall into disrepair. Jenny Slater Nelson, a local antiques collector who loves history saved the house from demolition. Now it's Mimi's Memories Antique Shop. 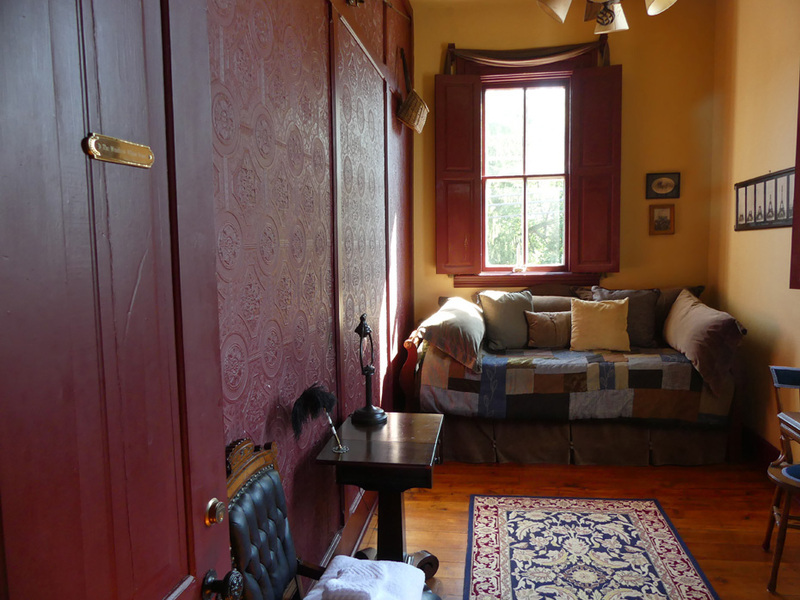 She rescued the doctors' cabinets, bottles and medical equipment and recreated the front room as it would have been in the doctors' lifetime at the turn of the 20th century. She restored the back room with an exam table, instruments and the doctor's original desk. There are even records of the babies they delivered. It cost $2 if you had your baby in the office but went up to as much as $10 if you needed Dr. Mershon to come to your home and deliver. 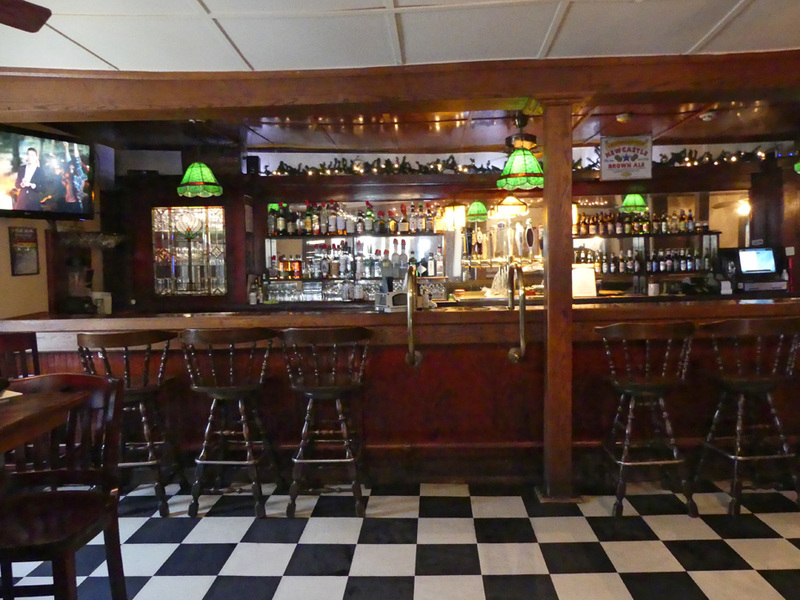 A visit to Saxonburg is a trip into an interesting past.